Before you smash the “Post Comment” button with the fury of Zeus himself, we’re going to go ahead and say it: if you want to build a decent quadcopter, buy a commercial frame. They are usually one of the cheaper parts of the build, they’re very light for how strong they are, and replacement parts are easily available. While you could argue the cost of PLA/ABS filament is low enough now that printing it would be cheaper than buying, you aren’t going to be able to make a better quadcopter frame on a 3D printer than what’s available on the commercial market. The frame features a surprisingly low part count. Having said that, [Paweł Spychalski] has recently shown off his 3D printed FPV racing quadcopter frame with some surprising results. The frame ended up being surprisingly stiff, and while the weight is a bit high, it’s actually lighter than he expected. If you’re looking to build a quad with the absolute minimum of expense his design might be something to look into. Of course, [Paweł] is hardly the first person to think about printing a quad frame. But he did give his design some extra consideration to try and overcome some of the shortcomings he noticed in existing 3D printed designs. For one, rather than have four separate arms that mount to a central chassis, his design has arms that go all the way across with a thick support that goes between the motors. The central chassis is also reassuringly thick, adding to the overall stiffness of the frame. The key here is that [Paweł] printed all the parts with 2 mm thick walls. While that naturally equates to longer print times and greater overall weight, it’s probably more than worth it to make sure the frame doesn’t snap in half the first time it touches the ground. Beyond the printed parts, all you need to assemble this frame are about a dozen M3 nuts and bolts. Overall, between the hardware and the plastic you’re looking at a total cost of under $5 USD. In the video below [Paweł] puts the frame through its paces doing some acrobatic maneuvers, and it looks like 5 bucks well spent to us. If you want to go all-in on 3D printed quadcopter parts, you can pair this frame with some printed propellers. Perhaps even a printed camera gimbal while you’re at it. After watch the video particularly the FPV footage I was trying to put myself in the pilots seat so to speak but found the view to be very limiting. With the camera fixed facing forward I felt there was so much information I was missing. As some of the maneuvers were performed I found myself wanting to look up or over my shoulder, left and right to maintain my sense of perspective or reference I suppose. Are all FPV systems restricted or are there better systems that give a much wider field of view? It seems like two video subsystems might be an approach for those that would like to view the flight in decent resolution after the flight whilst still be able to drive through a low-latency view, which typically requires sacrifices in resolution to boost framerate. The normal moderate resolution low-latency stream is transmitted to the pilot, while the high resolution stream would be written to microSD. for after-flight viewing. STM32F4x supports a snappy 4-bit wide SDcard interface for pulling the stream off the camera if the pins for it are available. The viewpoint controlled by the pilot, we use no extra bandwidth and pull the card out after to play on our tablets. All with minimal weight added (the functionality of a GoPro, on a small STM32 board equipped with an sdcard interface, nestled near the hi-res camera. I wonder if three fixed mount moderately wide-lensed cameras would be lighter than a gimballed camera, and what it would take to stream three video streams. You could tile them together at the presentation end so they were seamless. I wonder whether it is hard switch framerate or resolution of the camera depending on which screen I am looking at. The primary screen (the one I’m looking at) will eat most of the bandwidth while other have smaller framerate and resolution just to give peripheral hint. Or, have central camera always at full resolution and framerate while side cameras at lower upscaled resolution to have panoramic view with central picture in crisper resolution. It’s not that the view is restrictive, it’s that you’re not in control of it. The pilot looks left when you want to look right, and that results in frustration. The same thing happens when you watch someone else play a game and they don’t do the thing you would have. When you’re actually piloting, you’re free to turn the drone to point at whatever you’re interested in, and there is no issue. Yes and no – I have experienced it with my frustration in driving an FPV car some 20years ago the lack of peripheral vision made it very difficult. I want to look left/right before I turn. Otherwise it would be like driving a car with the side windows covered up. Different thing, I think.. I could see how it’s an issue with cars because your limited in how fast you can turn and what axis you can rotate on.. flying quads fpr is entirely different and I think that having head tracking or some other way to turn your view would get disorienting..b personally, I have absolutely zero issues with flying my racing quad fpv.. I always know exactly where I’m headed because I’m pointed straight at it. Only think I do want sometimes is a way to lower the attack angle for landing because that’s the only time that I can’t see where I’m going to end up or what is below me in my flight path. But even that can be partially mitigated by a quick 180 turn right before I land.. I wonder if he’s looked into annealing his printed parts? supposedly it helps. I’ve seen some good frames that were designed for quick repair after crashing. The arms were held to the body with zip-ties. In a crash, the zip-ties break, and are easy to replace to get back to flying. This is a better approach than trying to make an indestructible frame. In case of recreational use, that would be fine. Replacement parts can be printed cheap, so you can have a few in stock, in case of crashes. 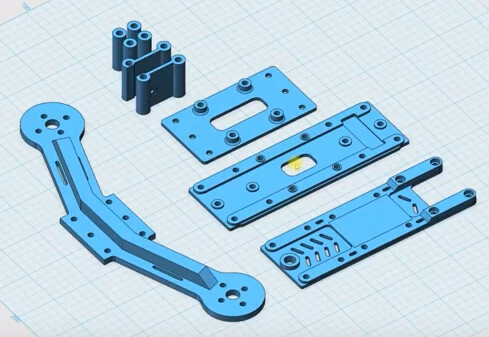 3D printing flat sheet parts seems kinda’ dumb… why not ACTUALLY USE the one significant advantage a 3D printer offers over traditional methods – complex 3D structures? Not only would the print be lighter and stronger, it could also be more aerodynamically compliant. It’s a benefit cost analysis. While it may be cool to make something complex, there just isn’t enough known benefit to justify the cost. But you don’t have to believe me. You can do the research yourself. I’m less interested in racing and more interested in search and rescue and other more ‘practical’ applications, so the quads usually have stabilization and waypoint navigation, meaning they generally dont suffer crashes. I don’t think 3D printers are ideal for drones, you need a very light strong material and that’s better achieved otherwise. It’s a usable alternative though, but not ideal. I have been liberated thanks to my 3D printer! Now, when I crash a drone , I find the weak point, improve the design, hit print and am back in the air that day. I am now able to hit a brick wall at full speed with no damage, and it is relatively light. Sure beats waiting for a month for parts from China! Any way we can check out the design? Can you, or do they make ultra high molecular plastic spools for printers. UMHW has been around a long time. bobricius has updated the project titled Simple Open PCB Tesla coil. Craig Watson has updated the log for Microfluidics control system. bobricius has added a new log for Simple Open PCB Tesla coil. Craig Watson has updated the project titled Microfluidics control system. George Zimbru wrote a comment on Programmable Light Controller.